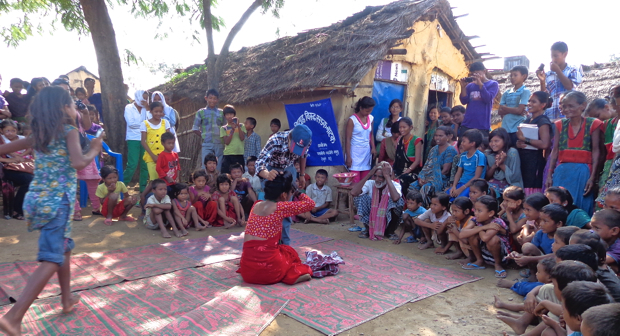 Using street theater, leaflets, posters, counseling sessions and house visits, NYF staff and counselors are working hard to encourage young women in western Nepal to stay in school and resist family pressure to marry early. Last year, counselors reached nearly 2,500 teachers, parents, community members and girls who were formerly indentured servants through orientation sessions, street drama, house visits and leafleting public bulletin boards. Staff registered several cases of early marriage with the local police. The project is part of NYF’s Empowering Freed Kamlaris program which helps former Kamlari girls become healthy, happy and independent young women. NYF has rescued more than 12,000 girls since launching our campaign against the Kamlari system in 2000. While marriage before the age of 18 is illegal, police and community members have tended to ignore the issue. Families often view their daughters as an economic burden and pressure them to marry, and this has been a particular problem for the girls we have rescued from Kamlari slavery. NYF hopes to end the practice of early marriage by making girls, boys and their families aware of the negative health and economic consequences of dropping out of school and marrying young. We have also formed 21 support groups for boys, with a total of 225 members. We’re happy to report that boys have enthusiastically embraced the cause and are sharing information with their families and communities. 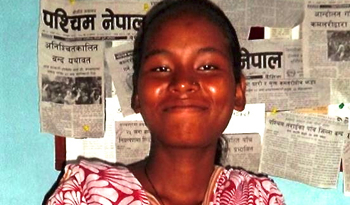 NYF helped sixteen-year-old Santoshi, a former Kamlari servant, resist family pressure to get married. Suffering from severe depression, Santoshi’s friends encouraged her to join a NYF counseling support group where she learned to talk about her problems and develop strategies to deal with them. Counselors also visited her family and talked about how early marriage could negatively affect Santoshi’s life. It’s working. Santoshi is now in NYF’s Vocational Education and Career Counseling program, where she is learning job skills and working hard to build a bright future for herself. Read about our Empowering Freed Kamlari Program. Watch the ABC7 News video about NYF’s work to free girls from slavery. Read about NYF’s Vocational Education and Career Counseling.